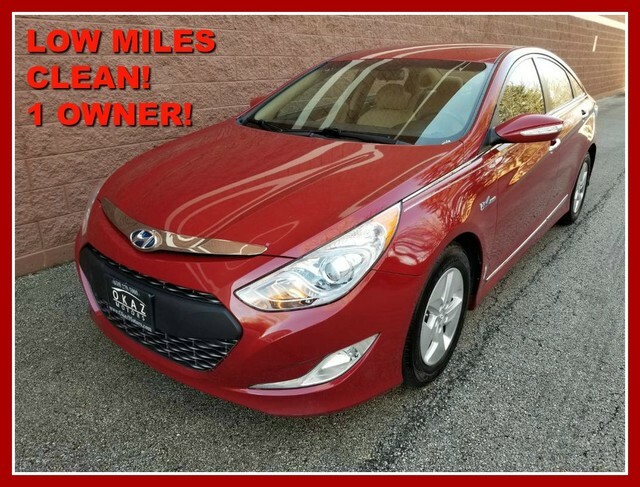 Contact Okaz Motors today for information on dozens of vehicles like this 2011 Hyundai Sonata Hybrid. Only the CARFAX Buyback Guarantee can offer you the comfort of knowing you made the right purchase. CARFAX shows that this is a one-owner vehicle -- no wonder it's in such great condition. This wonderfully fuel-efficient vehicle offers a supple ride, quick acceleration and superior styling without sacrificing MPGs. You can tell this 2011 Hyundai Sonata has been pampered by the fact that it has less than 69,000mi and appears with a showroom shine. All records are included with the purchase of this well-maintained pre-owned vehicle. The interior of this Hyundai Sonata Hybrid has been through meticulous inspection and could almost pass for a brand new vehicle. Fast? That doesn't even begin to describe it. Get behind the wheel and take it for a spin to see just what we mean. A unique vintage vehicle that exudes taste and sophistication. Hyundai has put longtime mid-size best-sellers, including the Honda Accord and Toyota Camry, directly into its sites with the all-new Sonata. Hyundai meets or exceeds those models in most respects. With new EPA fuel economy ratings of up to 24 mpg city, 35 highway, thanks to a new direct-injection 4-cylinder engine, the Sonata has fuel-efficiency and power performance numbers that are both better than most base-model mid-size sedans. The 2011 Sonata is now classified by the EPA as a large car, and has more passenger room than most of its competitors, while it has significantly more trunk space than the Toyota Camry, Nissan Altima, Ford Fusion and Chevrolet Malibu. The Sonata is also lighter than almost all of its rivals and has a short 35.8-foot turning diameter that's also shorter than most other mid-size sedans. The Sonata also has a trump card in safety, as it's already been named a Top Safety Pick by the IIHS.